Australia’s small businesses keep the country running. Baristas keep our bodies pumping with coffee, booksellers keep our ideas flowing, and sparkies keep the lights on. It’s a tough gig running a small business, and small business owners can do with all the help they can get to grow. One place every small business owner can get a boost is online. The internet is like a double shot of espresso for small business. It means small businesses can set up sticks in the world’s biggest shopping mall, for free (that’s the internet, by the way…). It helps new customers find them, and helps old friends write great reviews. Yesterday, we got some small business owners together over breakfast in Melbourne and heard from some of them who are doing a great job online. For instance, Leon Mugavin, owner of the Leaf Store, in Elwood, said he thought of his online presence as being a direct extension of his shopfront. Karin Voelske, of Yarn & Co, in Fitzroy, said that the web helped create a sense of community among her customers. Chris Crouch of Happy Valley store in Collingwood, and Emma Moore of Clip 'N Climb in Richmond also had some great tips. The Minister for Small Business, the Hon. Bruce Billson MP, and the CEO of the Australian Chamber of Commerce and Industry, Kate Carnell, joined us and reminded us of research from Deloitte Access Economics that shows that small businesses that are making the most of the web are growing twice as fast as those that aren't. That’s great news for the ¼ million small Aussie businesses that Google and our partners will support this year. We also took the opportunity to get an update from Deloitte Access Economics on the barriers and opportunities facing small business, and found that digital experts are tipping the mobile web as the next big opportunity for small businesses to reach customers. But you don’t need to be a digital expert to make the internet work for your small business. Google has recently launched a new and easy way for small businesses to get online. And it’s free. To find out more, have a look at Google My Business. 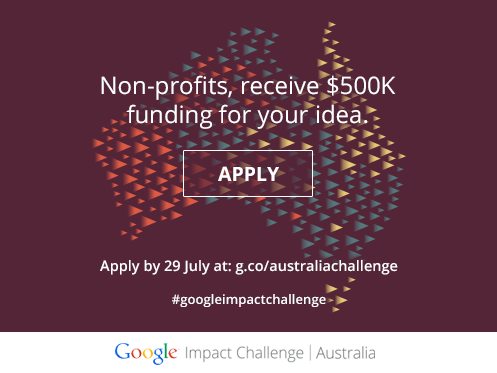 for the opportunity to share in $2 million of funding. We’ll reward the four winning submissions with a $500,000 grant plus mentoring and support from Google employees to help make each project a reality. From conceiving the Hills Hoist to inventing the bionic ear and WiFi, Australia has a rich history of innovation, fuelled by a desire to solve tough problems with technology solutions. We believe technology can help solve some of the world’s most pressing challenges, and today we’re announcing a new program to support Aussie innovators in the non-profit sector who want to use technology to make an impact.